I dont want to watch. I can not control my tears. So no hit to your clip. For a non muslim its totally new feeling. Also it is Allah's blessing upon this person. Subhan Allah. Don't worry about us Muslims, New or old it's none of your business. It's about the spiritual awakening of a once staunch white terrorist who almost killed 200 muslims. It's about how a small girl changed a big man! In your life you ONLY have two paths. If you are not walking on Allah's path, then where are YOU going? 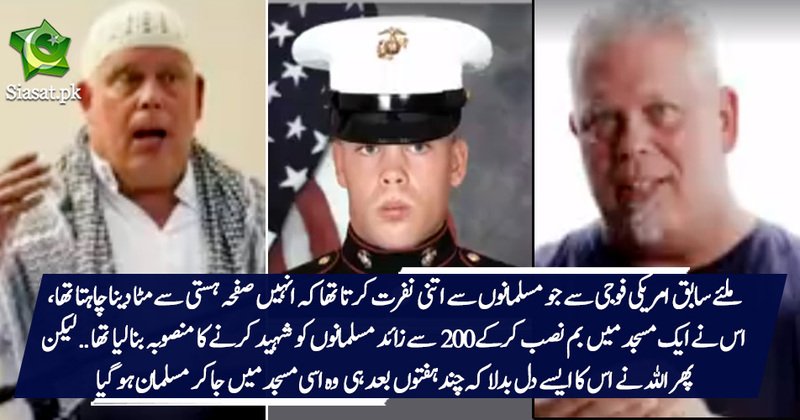 Great story, this gentleman can be a great preacher of peace among non Muslims. Its a great beautiful story of how one person found the deen, nothing tearful about it, a happy positive story. Thing is maybe people in Pakistan are not used to this but overseas you see this a lot, people converting or as some call it reverting to Islam. One of my good friends, a pure white born and bread in Oregon USA is a convert not only that but a proper qualified mufti from Al Azhar and funny thing is, he converted after 9/11. My better half is also convert. I also know a very bitter British lady who is a huge anti Muslim Islamophobe but by grace of Allah her own daughter converted to Islam and married a Muslim man and that literally kills her inside everyday thinking about it. But if he was in Pak he would have been killed by our jali molvis and rizvi dallah. Hence proved we should not kill people for their mistakes but pray for them to walk on the right path. Surah 87 AL-AALAA – Sovereignty of this universe belongs to Allah alone so mankind should learn to live by His advised way of life as a proper human community in His kingdom to carry out His program if they wish to end up in blissful, dignified and secure existence. This surah is named AL-AALAA from roots AIN, LAAM and WOW/YAA. As already explained it means something over or above or higher or beyond or something alike in some sense in some way for some reason or purpose. Also the ultimate, to rise, to mount, the honoured, the dignified, sovereign or sovereignty, authority, the exalted, the one in control, someone overpowering or overwhelming or conquering, the one who is arrogant or dominant or proud or sublime or revered or held in highest esteem, to have dignity or be most respectable, to rise, to overrun or overcome etc etc. This surah is named AL-AALAA because Allah is sole authority for his creation and since Allah is sole authority for this kingdom of the universe therefore his rule of law is supreme for all things including human beings. This is why his advised way of life is the best way of life for mankind to live by in this universe. It is because he has designed all things including human beings and put them to work for fulfilling his purpose according to his plan. This is why all things are bound by his purpose and plan which also binds Allah to his own purpose and plan so nothing can exist or happen outside this purpose and plan. All this was done by choosing of Allah himself because there was nothing else there to consult with. He has not created anything at all which is not functioning or fulfilling some useful purpose regardless we human beings have managed to figure it out or not. Allah has created human beings with great potential to be able to accomplish his purpose according to his plan this is why human beings are capable of discovering all needed information about things but all this will unfold with time as people become more and more capable. Because Allah has created human beings for fulfilling his purpose and plan therefore he has created all things human beings will ever need for fulfilling his purpose and plan. This is why this universe is full of raw materials for mankind to make use of as they see fit by taking naturally existing things and modifying them through process of deconstruction and reconstruction. In other words human beings are given huge potential to restructure things in this universe. Things in this universe are like toys for people to play with and learn from by direct or indirect experiences with help and full support of each other. This surah explains the fact that Allah alone is rightful ruler of this world and people will gain a lot by accepting his guidance and living by it. Any other way of life they will adopt will lead them to the same ultimate end but after a very, very long time and after a lot of difficulties as well as painful suffering. The way of life advised by Allah is the very same that was told to people of the past. Some benefited by following it and others decided to go their own ways and faced the consequences about which they were informed or alerted or warned beforehand. The main thing one should remember always is that the Quran talks about a self organised and self regulated human community in a kingdom that makes all rules and laws within the God provided framework through mutual consultation, because goals are set by God for mankind to accomplish by implementing his given program and he has provided mankind with guidelines for formation of constitution to based themselves upon and to legislate laws to regulate themselves by as a proper human community in a kingdom to ensure their own well being through help and full support of each other. This is why people must teach each other and learn from each other message of God properly or not doing so will always have serious consequences for them in this life as well as in life to come. This explains proper context of what is meant by striving or struggling or making effort or endeavouring for establishment of deen of Islam or way of life based upon the Quran that can lead humanity to blissful, dignified and secure existence as a proper human community in a kingdom. This way of life is supposed to be liked by all involved on basis of best possible reasoning that is why they ought to come together and live by it as a proper human community in a kingdom therefore there remains no need for anyone to go against this program or its constitution or law or their community. If odd person falls out for some reason at some time correction institution are set up to deal with all kinds of eventualities appropriately. Deen of Islam is not at all about rule by mullahs or politicians or money lenders or tribal chiefs etc. Instead it is an ideological community based ruling system in light of the Quran for the good of whole human community to benefit all its individuals. Parties are not allowed in deen of Islam instead individuals are supposed to support individual issues on basis of same goals and guidelines for the very same program so there is no need for vested interest based parties. This is why there is no concept of people ruling people by any ways and means or tricks and mechanisms such as taking over each other by force of arms or using wealth or using religion for fooling each other in the name of worship of God. Deen of Islam is way of life advised by God whereby people are supposed to fulfil purpose of God according to his plan for which he created them. It is because human beings have needs and these human needs must be fulfilled first so that they could stay alive before they could accomplish the rest of program of God therefore deen of Islam is not about pooja of God as mullas will have us believe. It is because human needs for living have priority over rest of program of God this is why Islam is not a religion at all. By taking religious rituals as God advised way of life people cannot fulfil their daily needs without fulfilling which they cannot even stay alive let alone carry out pooja of God. Worship of God according to the Quran is helping each other fulfil human needs eg feeding each other clothing each other etc etc. Moreover people need to ask themselves why rulers and money lenders back mullas by donating to them parts of their wealth and by making for them places of worship and mazaars ie structures over graves of dead people calling them saints etc etc? Why these people do not build schools, colleges and universities or hospitals and industries for all people to become educated and healthy as well as to have secure jobs etc? They do so to divert attention of masses from their way of life and life style. Mullas provide them with brainwashed masses to be used by them as slaves because they tell masses Allah makes people rich or poor. Anyone can see throughout the world how rulers, money lenders and mullas send their own kids to top schools and universities and how they have top hospital for themselves to go to if they get ill. Anything they do for any person from among the masses is mere tokenism for diverting attention of masses by pretending to be Godly. This is why these like people are enemies of God and humanity. This is why mullas=priestly class or clergy etc have misinterpreted and misrepresented God sent scriptures always as the Quran itself tells us. Without people striving hard for establishment of way of life advised for them by God to live by it cannot become established all by itself. This is why striving for deen of Islam or for way of Allah to become a reality is foundational requirement of a person who claims to be a Muslim otherwise one is only paying lip service to deen of Islam. Striving for deen of Islam as already explained in detail means learning the message in the Quran properly and then teaching it to others. This is all an individual Muslim is required to do till people become a proper human community and then they work towards having a kingdom based upon guidance of Allah and maintain it properly so that it does not fall apart. These verses are very clearly talking about origin of things then origin of living things and then from among them about origin of mankind. Word SAWWAA is about modelling of things into what they were supposed to be according to the purpose for which they were designed. This evolution process involved adding things to things and taking away things from things so that they end up what they were required to be as end product by their design. SAWWAA is therefore a very comprehensive word. The way things happen in nature involves natural laws which determine how things should be naturally. None living things therefore are always under laws of nature almost fully but even living things are designed by nature to a great extent and the only exceptional thing is human being. Human beings are also subject to laws of nature but they are also given rule of law to rise above nature ie be able to use laws of nature to their own advantage to a much greater extent than all other living things. The religious concept of predestination has nothing at all to do with the teachings of the Quran. TAQDEER in the Quranic context means laws of nature or set measures for functioning of things and not that man is bound by God in every way so he has no ability to choose to do things he chooses to do. God has set goals for people to achieve for which he created them and he has given them his guidelines to achieve their God set goals according to them. This clearly shows man has freedom to do what he chooses to do. People needed things to live and work with in order to accomplish God assigned goals or God set tasks to fulfil their God given mission and that is why God created all things for people to help them learn and do what needed to be done by them. So there is plenty of fodder or junk or material for mankind to keep busy with till the job is done. That is the time when this world can end and not before that. For so long as God given task is not fulfilled by mankind this universe will remain in existence and so will human beings and all things they will need to carry out their God given mission. So all nonsense by priestly classes of various religions that have been telling their followers the world is going to end tomorrow should be ignored. 5] because He made human kind capable of deconstructing and reconstructing things according to His given program in order to fulfil His purpose for which He created mankind. Word GHUSAA-AN is from root GHAIN, SAA and WOW. Concrete meaning of this root is or something alike in some sense in some way for some reason or purpose. Also wreckage or flotsam or waste or scum or debris or cargo or rubbish or detritus or raw material or discarded material or recycled material or junk or scrap material or trash or garbage or mullock or crap or lumber or odds and ends or remains or refuse or dross or something alike in some sense in some way for some reason or purpose, rejected people or people looked down upon or downtrodden people or people held in contempt or the like in some sense in some way for some reason or purpose, useless or rejected things or materials or things lying about which could be useful or unused things or dismantled things or dry vegetation or dismantled things that can be reassembled or things which could be reused or something alike in some sense in some way for some reason or purpose, twisted rope or string or thread or something alike in some sense in some way for some reason or purpose, whirlwind or whirlpool or storm or vortex or cyclone or eddy or maelstrom or swirl or Jacuzzi or something alike in some sense in some way for some reason or purpose, framework or bone structure or chassis or dummy or model or statue or sculpture or mould or shell or sketch or outline or clothe hanger or scarecrow or sail mast or flag pole or flag-post or replica or straw filled animal skin to act as dummy animal or draft or blueprint or plan or bare bones or main points or key map or rough draft or frame or basic structure or concrete skeleton of an unfinished building or essential part or parts of something or basic structure or supporting framework or something alike in some sense in some way for some reason or purpose, link or connection or relationship or addition or addendum or growth or enlargement or extension or tie or bond or something alike in some sense in some way for some reason or purpose, to deconstruct or dismantle or disassemble or pull apart or restructure or redo or destroy or break up or strip down or take apart or do something alike in some sense in some way for some reason or purpose, to lurch or stumble or shamble or shuffle or reel or roll or spin or rotate or cycle or recycle or go round and round or make rounds or bowl or turn or turn over or toss or rock or oscillate or go back and forth or pitch or plunge or sway or keel or wobble or list or stagger or totter or teeter or labour or toil or travel or move or go or cruise or sweep or waddle or trudge or clump or stump or plod or tramp or stamp or stomp or thump or thud or bang or do something alike in some sense in some way for some reason or purpose, to hang out clothe or things to dry or do something alike in some sense in some way for some reason or purpose, to hang or hold or catch or latch onto or do something alike in some sense in some way for some reason or purpose, to link or connect or bind or tie or do something alike in some sense in some way for some reason or purpose, to form a network of people or things or build links or roads and bridges or create ways and means or do something alike in some sense in some way for some reason or purpose, to make a contact or get in touch with or do something alike in some sense in some way for some reason or purpose, to be turned or twisted or bent or crooked or wicked or deceptive or tricky or clever or intelligent or sharp or brainy or something alike in some sense in some way for some reason or purpose, to go round and round or make rounds or cycle or recycle or keep going through same or similar act or process or do something alike in some sense in some way for some reason or purpose, to be clumsy or awkward or heavy-footed or blundering or bumbling or inept or maladroit or uncoordinated or ungainly or oafish or ungraceful or gauche or lumpish or cumbersome or ponderous or laborious or stolid or something alike in some sense in some way for some reason or purpose, twister or something alike in some sense in some way for some reason or purpose, to decorate or arm or prepare or equip or make ready or gear up or make presentable or beautify or do something alike in some sense in some way for some reason or purpose, skeleton or something alike in some sense in some way for some reason or purpose, hook or something alike in some sense in some way for some reason or purpose etc etc. Originally mankind had no idea about anything at all but gradually over time they managed to discover things for themselves and today they know much more than ever before but this is going to continue because there is yet far too much which is still unknown to mankind. People are going to discover yet more new ways of learning and teaching information to each other as well as ways to hold on to that information so that it is not lost as it was in the past. 7] particularly that knowledge about things which you will need to serve Allah’s purpose. Surely He makes known for mankind as appropriate in due course all that is self evident as well as all that is hidden. All information whether visible at present or becomes visible in due course is from Allah alone who has given mankind the abilities and potentialities to realise and actualise them. All this needs time and effort by people themselves. So those who make efforts and learn to do things become better aware of things and make their life easier and those who do not remain ignorant about things and thereby make their own life difficult to cope with. So people should try their best not to remain babies all their lives by not taking interest in learning things because growing up not only means biological growth but also psychological growth as well as sociological growth and on top of all that spiritual growth ie growth based upon proper understanding of the divine revelation. 8] This is how We will make easy for you the mankind to follow the path of least resistance to blissful, dignified and secure existence. As people learn things, it will become obvious to them that deen of Islam is the way to live their lives properly because people who become convinced about something good go for it. 9] Therefore you the mankind should deliver Our message to each other properly because Our provided guidance can ensure well being of all human beings with help and full support of each other. Here the Quran is making clear the point that before people could understand the Quran they need to become aware of the fact that they do need guidance of their creator and sustainer because without that awareness people cannot study the Quranic message properly. When someone become aware of what one needs or why or how one can get it then when one gets the thing he knows what to do with it or how to use it properly to get what wanted to get out of it. On the other hand if one is given something in one’s hands about which one has no idea what it is or what’s use of it etc etc then one just throws it away or ignores it. Need makes something valuable in one’s eyes. People who are ignorant about usefulness of something cannot put any value on it. People who do not even want to know anything at all about guidance of Allah cannot be convinced because they are not prepared to think things through. This is why they have turned this world into a hell hole for the rest of humanity. They think of themselves as civilised but in actual fact they are not otherwise they could not have the mindset, attitude and behaviour which they express towards revelation of God. This agony is not punishment in hell fire by God but hell people create by themselves by harbouring hatred for each other and making their environment full of hate for each other which makes their own life difficult as a result as already explained in detail. 13] wherein such a people will neither be able to live nor be able to die. People who commit crimes against God and humanity ultimately become entrapped by their own thinking and doing in this life. Their situation becomes like that of a criminal who ends up in prison and in order to escape this situation he tries to commit suicide but fails. In fact life in hereafter for people who deliberately commit crimes against God and humanity will be much worse than anything can be imagined in this life. 15] therefore mankind should adapt to the way of life advised by their Creator and Sustainer and become a proper human community in a kingdom under His rule of law to carry out His program. Human beings cannot escape harms and destructions by hands of each other till they learn to live for each other and that means coming together on basis of goals and guidelines provided by God. This is what the whole Quran is about as already explained in detail. 17] whereas survival of mankind for their best future rests upon Our advised way of life. Word SUHUF is from root SWAAD, HAA and FAA. Concrete meaning of this root is book or something alike in some sense in some way for some reason or purpose. Also scroll or scripture or record or writ or flat dish or plate or platter or large wide dishes or plates or bowl or a round dish or tray or an open book or saucer or leaf or epidermis or surface or exterior or honour or dignity or respect or reverence or news or news business or something alike in some sense in some way for some reason or purpose, the earth or surface of the earth or vast open space or fountains or ponds or pools or fords or ditches or pits wherein gathers water or where water is gathered or wide cup or pot or glass or written piece of paper or skin or face or collected pages of writings that are bound together as a book or volume of a book or newspaper or news magazine or journal or skin of face or a copy of the Quran or slip of the pen or slip of the tongue or something that has been altered or changed or something alike in some sense in some way for some reason or purpose, seed or origin or beginning or starting point or fruit or tree or branch or leaves or flowers or juice or extract or family tree or code of life or code of conduct or constitution or an agreement or a legal contract or charter or flowchart or something alike in some sense in some way for some reason or purpose, shield or protection or screen or partition or wall or blockage or stoppage or barrier or divide or separation or gulf or gap or distance or difference or dispute or conflict or antagonism or animosity or opposition or resistance or impedance or hesitation or reluctance or something alike in some sense in some way for some reason or purpose, mouth or entrance or way in or way out or entry or exist or gangway or passage or hole or bottom or something alike in some sense in some way for some reason or purpose, to branch in or out or merge or separate or to converge or diverge or do something alike in some sense in some way for some reason or purpose, to extract juice or squeeze the life out of or to get the essence of or do something alike in some sense in some way for some reason or purpose, to separate or isolate or boycott or cut off ties or bonds with or sever relationship with or break off links or connections or contacts with or do something alike in some sense in some way for some reason or purpose, to put up a barrier or partition or wall or barricade or leave out or lock out or lock in or bar or stop from or do something alike in some sense in some way for some reason or purpose, to guard or defend or look after or take care of or keep an eye upon or patronise or take into care or manage or handle or do something alike in some sense in some way for some reason or purpose, to eat or devour or gulp down or take in or eject or discharge or defecate or throw out or vomit or urinate or do something alike in some sense in some way for some reason or purpose, to make mistake in reading a writing or to edit or proofread or to displace or misplace or to misread or mispronounce or to misspell or to misrepresent or to distort or to twist or turn or bend or to change or modify or adjust or alter or improve or make worse or to change location of something or to change shape or size or colour or quality of something or change nature of something or do something alike in some sense in some way for some reason or purpose, to be an editor or a book seller or a self educated person or a journalist or news reporter or seller of plates or dishes or glasses or pots or seller of newspaper or newspaperman or newswoman or someone alike in some sense in some way for some reason or purpose, tree or plant or something alike in some sense in some way for some reason or purpose, fence or something alike in some sense in some way for some reason or purpose, mouth or something alike in some sense in some way for some reason or purpose etc etc. 19] including in scriptures We gave to Abraham and Moses.